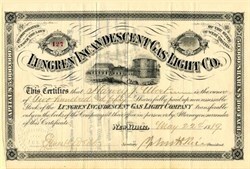 Beautifully engraved certificate from the Lungren Incandescent Gas Light Co issued in 1889. This historic documenthas an ornate border around it with a vignette of an building next to a gas storage tank. This item has the signatures of the Company's President and Secretary and is over 117 years old. Artificial Gas Made to o Better Service, Natural Gas as an Illuminant An important adjunct to the business of the Wheeling Natural Gas Company has been added by the purchase of the agency for the Siemens-Lungren regenerative gas lamp for a considerable territory, including Wheeling. This branch of the business is operated, it is true, under the name of the Natural Gas Illuminating Company, but this corporation is organized under the laws of West Virginia, the principal office is in Wheeling, and the capital stock is $50,000 which may be increased to $250,000. The Illuminating Company manufactures and sells the regenerative gas lamp. The chief advantages claimed for the Siemens-Lungren lamp are increased illuminating power at greatly reduce cost. One of the lamps is in use in the Intelligencer editorial rooms and gives complete saisfaction. The light is soft though powerful. It consumes eight cubic feet an hour, gives a hundred candle power, has taken the place of four eight-foot burners and performs a service which never was expected of the four combined. The Good Qualities A committee of the Franklin Institute of Philadelphia, a scientific society of high repute, made a very complimentary report in awarding a medal to this lamp. The committee said: "The Lungren Inverted Gas Lamp owes it efficiency to the heating of the air and gas which enter the flame, by means of the waste heat which is leaving the lamp. Resembling in this respect the Siemens lamps it has peculiarities which render it noticeable and increases its value to a marked degree. "The flame and the illumination is all below the structure of the lamp itself; there are no shadows; and the light thrown down from the suspended lamp is entirely unobstructed. The lamp is also of a form and structure which admits of its use in a variety of places, where the Siemens lamps could not be used so conveniently. Finally, its efficiency is much higher than that of the Siemens lamp in small and medium lamps, such as are used in the lighing of offices, stores and apartments of moderate dimensions, Its value for general illumination is, for this reason greater. "In measuring the light of the lamp, your committee found it necessary to construct a photometer for the angular measurements. Horizontal measurements were made on the bar photometer used in testing the Siemens lamp, however, the horizontal rays do not present its efficiency in actual use." The lamps vary in size and finish. They produce as high as 225 candle power, with a consumption of eighteen cubic feet an hour. They vary in style from plainest for factory and other like business uses to a highly ornamented chandelier for library, hall, or parlor. They are equally adapted to the use of artificial and natural gas, with the latter producing as good results as with the former. In Wheeling, the city owning and operating an extensive gas plant, does not permitt the use of natural gas for illuminating purposes; but outside of the city limits, in the numerous towns on both sides of the river, there is a wide field for this excellent lamp to add to the value of natural gas.